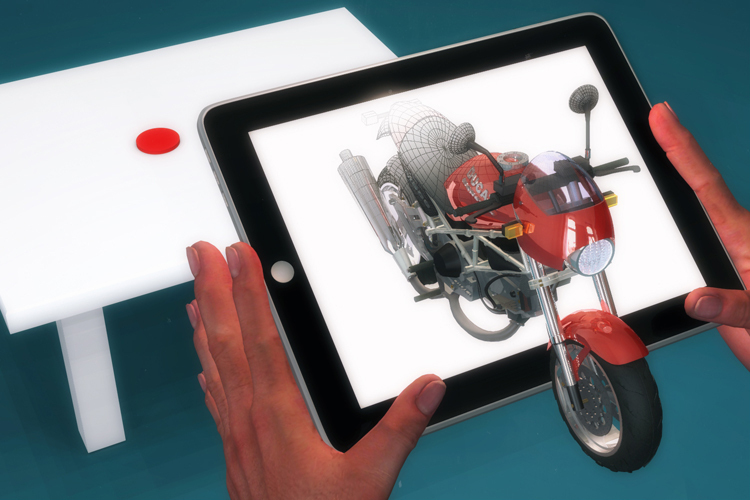 Augmented realities: is the end of physical manufacture in D&T on the horizon? Last year I wrote a blog about virtual reality as a design tool and how technology had finally matured to a point where it was possible to generate (almost) photorealistic environments for the users to become immersed in. As an avid follower of the technology since the early 90s, I am glad to see that it has maintained its momentum and is being used not only for entertainment but also for a wide range of practical applications. However, one other facet of VR slipped by me at the time of writing but has since become something of a phenomena itself; so much so that Apple is building it into its forthcoming operating system. Augmented reality, as the name suggests, adds to existing realities rather than immersing you in a virtual one. In layman's terms, rather than asking someone to don a bulky headset or VR goggles and become immersed into a totally computer-generated environment, it uses your smartphone, tablet or special glasses to overlay computer-generated images and models in a person's view of the real world. Now what, you may ask, has this got to do with D&T and engineering? Well, quite a lot actually, and the technology has numerous practical end uses. Imagine working on a car engine while wearing special glasses. As you look at parts, identification numbers appear over them like a hi-tech Ikea catalogue, assembly and repair instructions can be shown while you are looking at the parts and it could even animate how to assemble complex parts, all without you being distracted by looking at a manual. Surgeons could see bones and vital organs as if the patient were transparent while performing a complex operation. Drivers could have maps literally in front of their eyes so they can concentrate on the road. The practical uses are literally mind-blowing, and anywhere where information or instruction is required while performing a task, it could be invaluable. Many of these uses will incorporate the technology in consumer products to help in performing tasks in the real world, but what happens when it inevitably filters into the classroom? Well, let's be honest, kids will love it. Whether or not you see educational value in using such a technology in D&T lessons, kids will relish the chance to use their phones and tablets in class. But once they have seen a 3D model or floating screen pop up from a symbol on a card for the umpteenth time, how will the technology be of use in the creative design process? One could argue that even if they are just using the tech to hunt down symbols to access data or information, the process is engaging and therefore of benefit to the learning process. Once an object is designed, it could be viewed in the real world, which would be great for architecture, interiors and products, but I also suspect that such tech might one day negate the need for the making skills we still value so much. I recall the first year I moved to digital design folders. At first, it all seemed very forward-thinking and there is no doubt it made moderation easier, but I also missed having something tangible to hold and read. Of course, when we wanted a folder to use in lessons or show at an open day, we simply printed it from the digital source. I wonder if that will happen with another popular technology in regards to physical products that can be held and interacted with. There is a growing reliance on technology in terms of presentation and manufacture and it is only likely to become more pervasive in time. You can 2D print a folder from a digital source and you can also 3D print from a CAD model. With that same CAD model rendered or animated photo-realistically and placed into real-world environments via augmented reality, is there a danger that the need to physically make the product in a classroom environment will be removed? I am sure many would be shocked at the thought but how many of us already output parts to the laser cutter or 3D printer and maintain portfolios on a computer. Considering that the prototypes designed are unlikely to be production-ready, once the tech can perform physical tests on the CAD model will it negate the need to actually produce a physical outcome at secondary school level? We have reduced budgets, a decreasing focus on the making of products in design GCSE and huge developments in rapid prototyping technologies. Regardless of arguments for supporting traditional manufacturing methods in school, is it really hard to imagine a future where teachers sign off a virtual model of a design while moderators and external assessors experience it in a virtual or augmented reality from the comfort of their homes?